It will not be an exaggeration to say that dance guru Bulbul Chowdhury (1919-1954) is the pioneer of modern dance in Bangladesh, who appeared as a revolutionary character in the middle of the last century by popularising dance amongst the then conservative Bengali Muslims. Just after Partition, Bulbul Chowdhury was announced the National Dancer of Pakistan in 1949. He was also equally popular in India. Most importantly, by showing that dance was part of the Muslim-Mughal tradition, he helped break down Muslim conservative attitudes towards dance and make dance respectable and popular. May 17 marks the 55th death anniversary of the dance maestro. In his short life, just 35 years, the legendary dancer developed a unique style based on common myths and legends, folk tales, and history. Bulbul Chowdhury wrote and choreographed over 80 dance dramas. Among those Abhimanyu, Indrashabha, Sapure, Kabi O Bashonta, Maru Sangeet, Fashal Utshab, Bhabaghure, Jiban O Mrityu, Shiv O Parboti, Ajanta Jagaran, Arjun, Kalbaishakhi, Hafizer Swapno, Iran-er Panthashalay and others are remarkable. His original name was Rashid Ahmed Chowdhury; however he was popularly known as Bulbul Chowdhury. Born on January 1, 1919, Bulbul Chowdhury had been keenly interested in dance, music, painting, poetry and writing. He won the first prize for painting in an art competition held at Manikganj in 1934. But he earned fame mainly as a dancer, his career starting with Chatak-Dance, a dance that he had choreographed himself, at a cultural function at Manikganj High School. After passing the Matriculation in 1934, he went to study in Kolkata. He passed IA from Presidency College (1936), BA from Scottish Church College (1938) and MA from Calcutta University (1943). His stay in Kolkata for higher educational gave him an opportunity to nurture his talent as a dancer. During this period Bulbul came in contact with well-known artistes, such as sarod player Santosh Chandra, composer Timir Baran Bhattacharya, dancers Uday Shankar and Sadhana Bose. 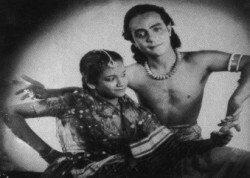 In 1936, Bulbul Chowdhury performed with Sadhana Bose in Rabindranath Tagore's dance drama Kach O Devajani. Hemlata Mitra, an admirer of Chowdhury, arranged this setting. And the duo became quite popular. In fact it was at this stage of his life Rashid Ahmed Chowdhury took the pseudonym of Bulbul Chowdhury, since at that period of time Muslims were not encouraged in the art field, informs Sheikh Mehedi Hassan, a PhD student of Department of Theatre and Music of University of Dhaka, who is doing a thesis on dance. "Bulbul Chowdhury, however, within a short period of time was successful in popularising the practice of dance for the Muslims," he says. 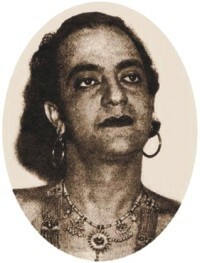 Between 1942 and 1954 Bulbul Chowdhury was the busiest dancer in the sub-continent. He and his troupe, which was called the Bulbul Chowdhury Dance Troupe, used to perform in all major cities in the subcontinent. In 1953, he visited Europe with his troupe, performing in Britain, Ireland, Holland, Belgium and France. He helped establish many organisations such as Oriental Fine Arts Association Calcutta and Culture Centre. Moreover, he helped many artistes from the then East Bengal such as Gawhar Jamil to become a distinguished name in the dance arena. At the initial stage of his career, Bulbul Chowdhury was highly influenced by legendary dancer Uday Shankar, who incorporated western ballet movements in Indian dance and thus introduced a new kind of Indian dance. His dances were rooted in Hindu mythology; he used amply classical raga music in his choreography. Like Uday Shankar, Bulbul Chowdhury also used Hindu myths and folk tales as the theme of his dance dramas. "But from his remarkable work Iraner Panthashalay, a dramatic change is evident in his works,” Mehedi continues. “He became more dependent on Muslim myths and began to fuse the elements from traditional Turkish 'Sufi Dance' form.” Since muslins contributed a lot to music, he probably wanted to do the same in the field of dance. During this period, Bulbul Chowdhury used to perform in East and West Pakistan. Sohrab O Rustam, Yena Bhule Na Yai and others are his remarkable works during the latter part of his life,” informs Mehedi. Besides his contribution to dance, he was a writer. His novel, Prachi, on the Second World War, was published in 1942. Moreover, he wrote many short stories. He died on May 17 1954 in Kolkata. Bulbul Academy of Fine Arts (BAFA) was established in Dhaka on May 17 1955 to carry on his work and as a tribute to his contribution to dance and music. The organisation has produced a school of singers, musicians and dancers over the last five decades. Unfortunately, his innovative style of dancing has not been preserved even though some of his students Ajit Sanyal are alive. Only a sincere effort by his colleagues can help to preserve the unique dance style of the maestro.